Lapsi also know as Nepali Hog Plum is a fruit which is native to Nepal. It is used to make pickles and sweets. The fruit is rich in Vitamin C and has a tart flavor. This sweet pickle is a special favorite of mine and I make lots of it when the fruit is in season. It is found in abundance and can be preserved for a long period. The only problem is that my family eats it up too quickly ! Happy Cooking ! 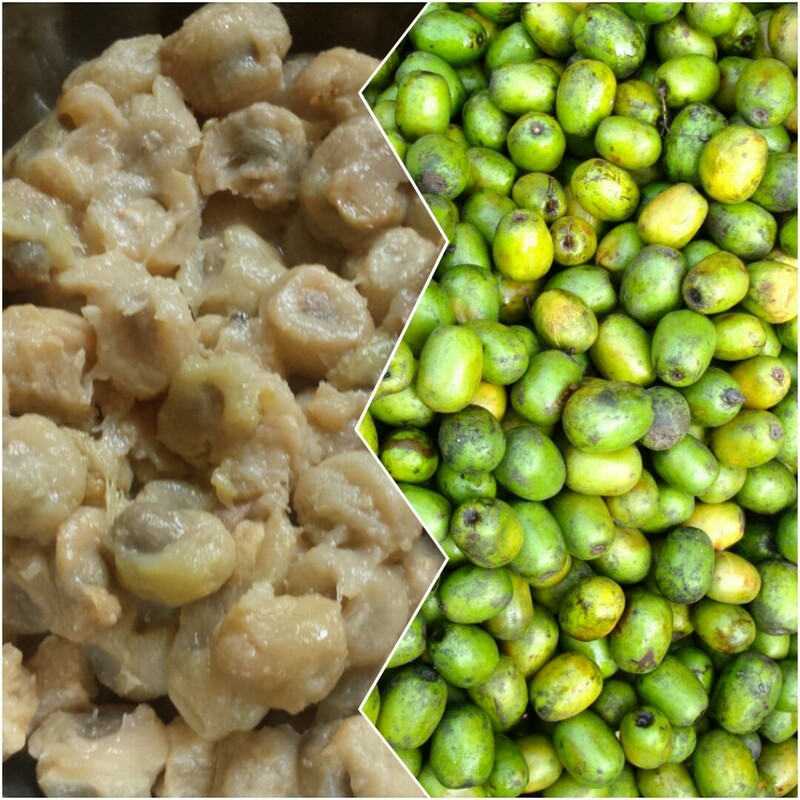 Boil the Lapsi fruit for 15-20 mins or until the fruit is tender and the skin peels off easily. The fruit should not be overcooked as the pulp and seeds should be intact. Remove the skins when it cools down and set it aside . Add the sugar and bay leaves with 2 cups of water into a pan and boil it till the sugar dissolves and a sugar syrup is formed. I usually use brown sugar as it gives a nice caramel color to the pickle but you can use regular white sugar as well. Take the seeds out of the green cardamom, crush it coarsely and add it to the sugar syrup. 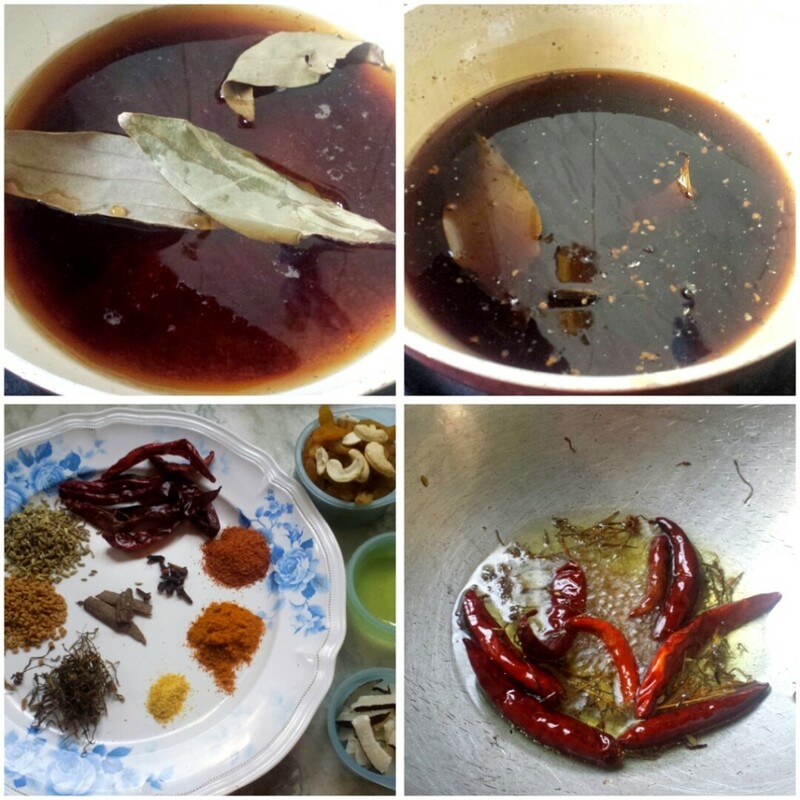 Heat the oil in a pan and when it is medium hot, add the dried chillies, fenugreek seeds and jimbu and fry for few seconds. Then add in the raisins, cinnamon, coconut slices, fennel seeds, cloves, turmeric and asafoetida and fry for 10-15 seconds. The raisins will all plump up. Then add the peeled lapsi fruit, chilli powder, salt and timmur. Fry for a minute and add in the sugar syrup and mix well. Keep stirring and cook for 10 – 15 mins till the pickle thickens up. 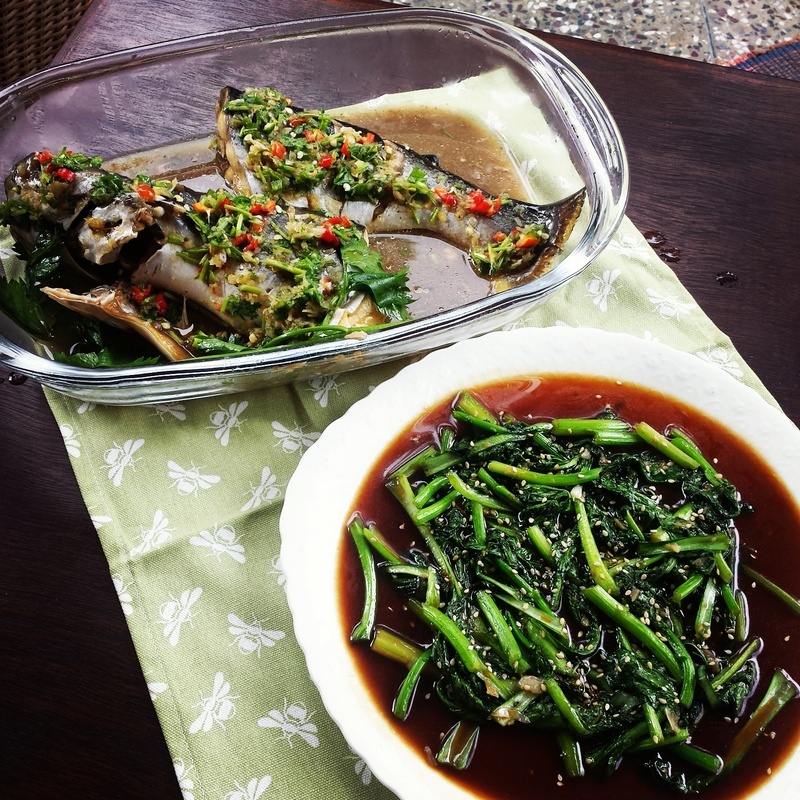 The steamed fish with fresh herbs and lime is a refreshing change from our usual style of cooking. 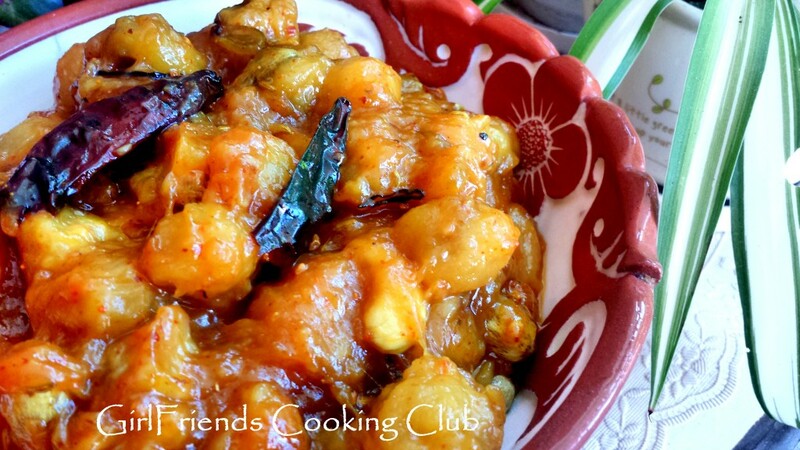 With no oil and the fresh taste of lime and the perfect combination of sweet, sour and spicy ….. it was a treat for the taste buds with the added benefit of less calories. 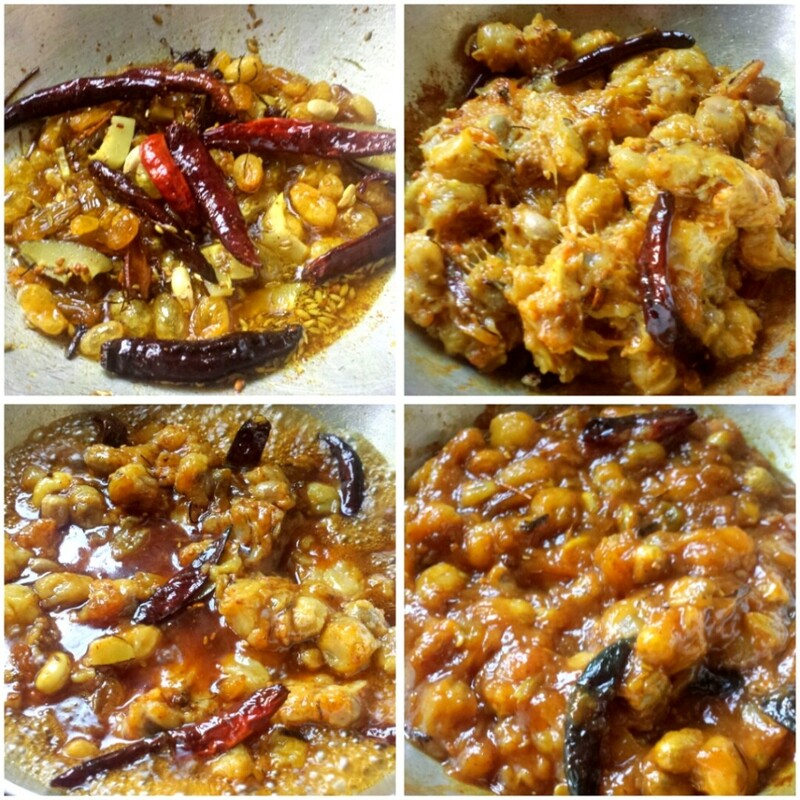 My family loved this dish, hope you enjoy it too … Happy Cooking ! Clean the fish thoroughly and make diagonal cuts on the sides of the fish so that it will cook evenly and faster. My fish was bigger than my steamer so I cut the fish into two equal parts but it is not necessary if your whole fish fits in your steamer. You can add some fresh lemon grass to the fish before you steam. 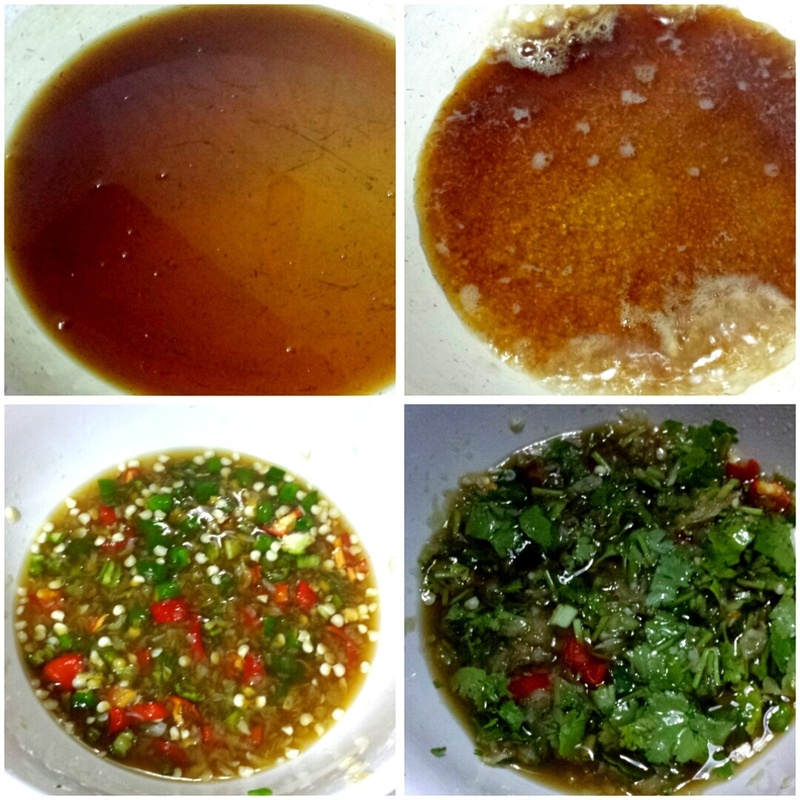 I did not have fresh one so I used dried lemon grass and some dried kaffir lime leaves. It is important to save the fish stock that come out of the fish when you steam it. Therefore, before you steam you fish, place a foil underneath it and then place the fish on it. 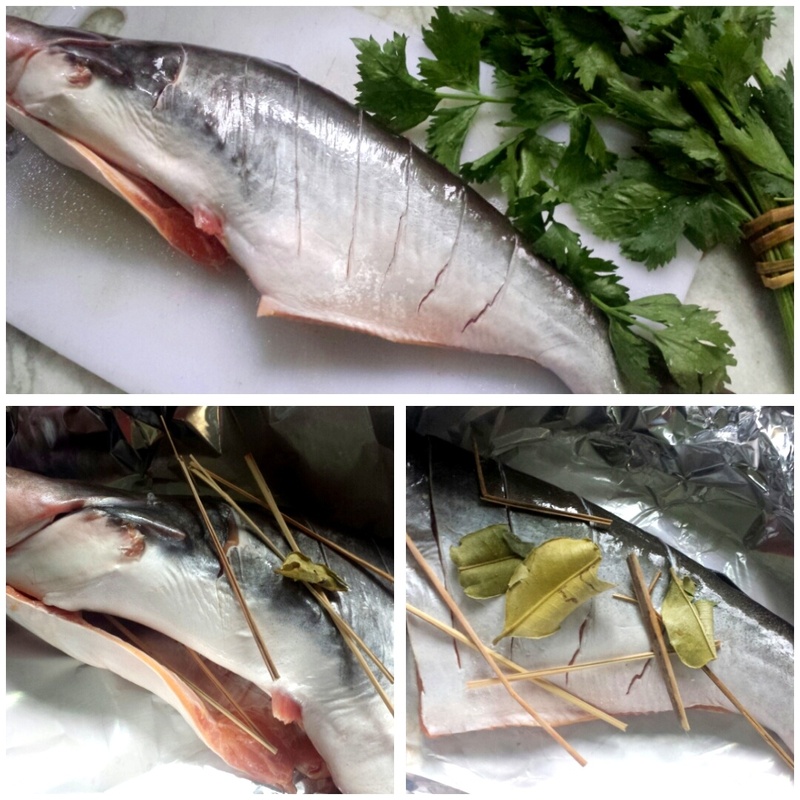 Fold the side of the foil and then place the fish in your steamer and steam the fish for 15 mins. Make sure the water is boiling and the amount of time it will take will depend upon the size and thickness of your fish. 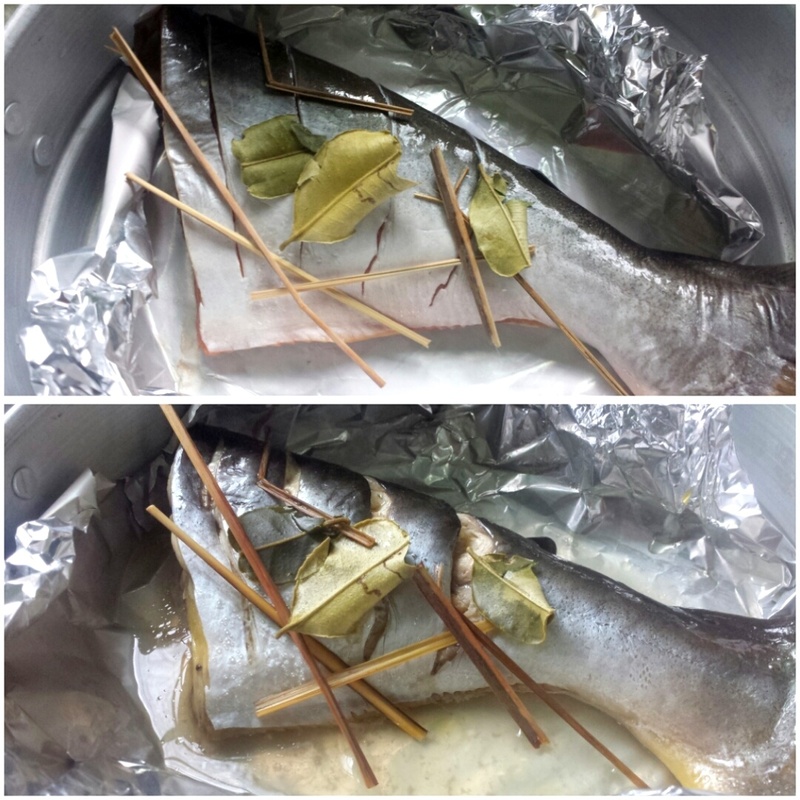 When the fish is done, some liquid will be collected in the foil. That is the fish stock and will be used along with the sauce. To serve, place the steamed fish gently on to a serving dish, pour all the fish stock over the fish. 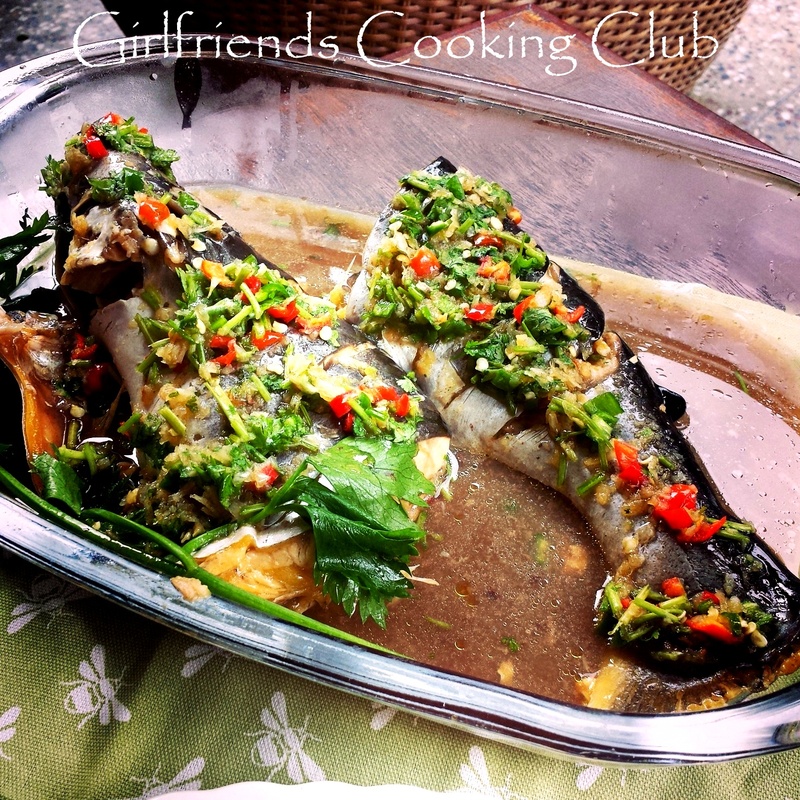 Add the chopped green coriander to the sauce that was prepared earlier and pour it over the fish to coat the evenly. You can serve it with plain steamed rice and I also add in Choysum with Oyster sauce as a side dish to make a perfect family meal. Enjoy !